I love Indiana Jones's famous bag, but the last thing I need is yet another mid-size satchel. I've been looking unsuccessfully for another small purse to replace one that's falling apart... so I decided to combine the two! In the movies, Indy's bag is a World War II British MKVII gas mask bag with the cloth strap replaced by a leather one. You can still buy these as military surplus, and there are a few prop replica makers that sell them. According to an Ebay listing for a vintage MKVII, the dimensions of the original bag are approximately 10" x 10" x 3". This half-size bag will be 5" x 5" x 1.5", though you could also scale up the pattern to make a full size bag. It is big enough for a phone, coin purse, and a wallet, with just a little room to spare. I have left off the bottom drain vents and the round circular thing on the side of the original, but these can be replicated with grommets and the right button. Note: it's ok to use food dishes for this project since you are dyeing with edible items and not using chemicals. Using computer jiggery-pokery or a ruler, draw the pattern out to the proper size on some paper. If using regular typing paper, you will need to tape sheets together. Unless otherwise specified, the seam allowances (dashed lines) are 1/2 inch wide. The original bag would have the side, front, and back pieces separate, but this version streamlines a small bag made with heavy fabric. To make the bag exactly like the original, you would need one piece 9.5 x 5", one piece 5 x 5", and three pieces 1.5 x 5" (plus seam allowances). The ring tabs are webbing on the original. You could also add interior pockets and a lining, but I didn't. First, wash and dry your fabric to pre-shrink it and remove any dirt or oils. If you don't, you won't be able to wash the bag later without damaging it, and the dye may not take as well. Canvas WILL shrink. Lay the pattern pieces out on the pre-shrunk fabric and cut one big piece bigger than what you need. This will give you some extra room to play with in case the fabric shrinks any more during the dyeing process, without having to dye a huge piece of fabric. Soak the fabric in a solution of half vinegar and half water. I used about 3.5 cups of each. Let sit for half an hour or so; make sure there are no air bubbles in the fabric. Squeeze the extra vinegar water out of the fabric when done. Save the vinegar water. In theory, green tea should have given me a nice yellowish green like the original bag, but the mint green tea I had was cheap and very old. I used 8 tea bags in 8 cups of water (doubling the tea would have given me better color). Boil the water, turn off the heat, then steep the tea bags for 15-30 minutes. Take the tea bags out, and simmer the fabric for 30 minutes, making sure the fabric stays submerged and has no air bubbles. Turn off the heat and let sit until cool. Since the tea didn't turn out very green, I also tried various kitchen spices. I used about 1/2 cup ground sage and about 1/2 cup of combined parsley, thyme, and basil (basically whatever green spices that we had a lot of in the cabinet). Boil about 8 cups water, then simmer the spices for 10 minutes and let them steep for 20 minutes or so. Add the fabric and simmer for 30 minutes, making sure the fabric stays submerged and has no air bubbles. Turn off the heat and let sit until cool. The longer the fabric soaks, the darker it will get. You want to go a shade darker than you want- the fabric will dry a little lighter. I let the fabric soak in dye for over 3 hours. Rinse the excess dye from the fabric. I gave it an extra rinse with the vinegar water to set it, just in case, but I don't think it was really necessary. Put the fabric in the old pillowcase, and dry it in the dryer to set the color. My fabric still smelled like tea and spices, so I washed it with some hot water and dish soap in the sink, then ironed it dry. The dye is semi-permanent - it can be washed occasionally by hand in detergent that does not have bleach or oxy cleaners, but it may fade over time with a lot of washing. Also, apparently tea dyeing will shorten the life of your fabric to 40-50 years...so it won't become a real antique? I don't need my purse to be archival quality, so that's fine. Both the tea and the spices gave a fairly subtle color. The tea ended up with a slight reddish brown, and the spices gave a faintly greenish khaki, which was closer to what I wanted, though a little darker would have been better. Since I didn't strain out the spices before putting the fabric in, the green has some darker splotches. More tea or spices should make the dye darker. Cut out the pattern pieces: one main body, one bottom reinforcement, two ring tabs, and if you want to add a zipper you may need an extra rectangle 1" x 6", depending on how wide your zipper is. Clip the corners of the seam allowances. Press all the seam allowances and fold marks in place. It would be a good idea to zigzag all of the seam allowances to prevent fraying, though I didn't. Fold the short sides of the ring tabs over 1/4 inch and press. Fold the long sides in so they meet in the center and press. Fold the tabs in half and press. Thread your rings into the tabs and set aside. On the bottom piece, fold over the seam allowances and press flat. Lightly press the fold marks to crease. Align the piece, seam allowances down, with the bottom of the bag (the 1.5" tall section inside the main body) and trim the side seam allowances to match the ones on the larger piece. Sew closely around the edges of the entire piece, and along the lines that mark the bottom of the bag. Make sure that you don't catch the sides or seam allowances. The reinforcement piece is now attached to the flat body of the bag. Leave the side seam allowances open for now. Fold the top 3/4" inch of the center seam allowance of the front edge over and press. Fold the rest (3/4") over again and press. Fold and press all seam allowances. Fold the corners of the front flap to the inside and press. Trim the corners so that there's not extra layers of fabric, or the snaps may not go into the fabric. Sew along the lower folds of the hems on the top edge of the front and sides. Fold the sides in, and on the outside of the bag, sew along the edge of the front corners (like making a pin tuck). Unfold, and sew on the ring tabs. I forgot to do this until the bag was assembled, and it was much more difficult. 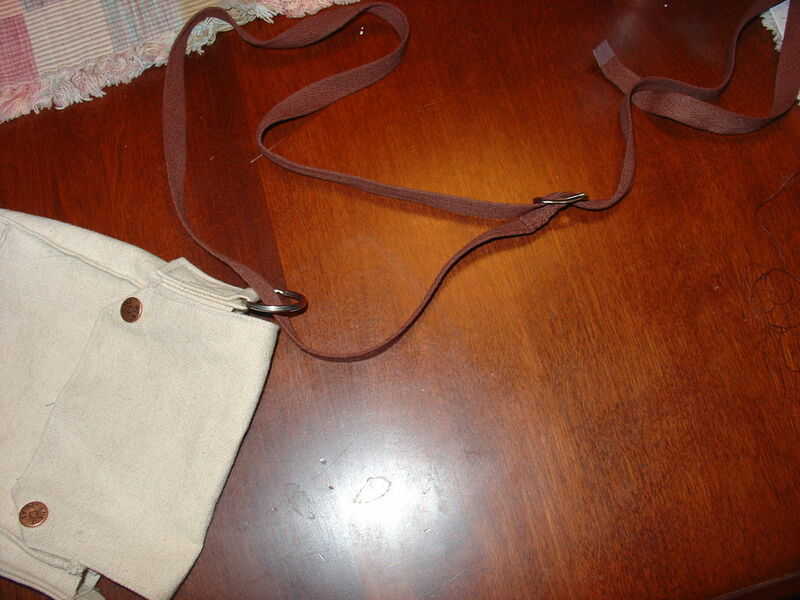 Flip the bag inside out and sew the seam allowances at the sides together. Flip the bag right side out again and align the sides and back. Sew them together so that they also look like a pin tuck like the front. The sides of the bag should naturally want to bend in, and the front and back should be flat. Sew up the edges of the flap, and follow the inside edges of the folded corners. 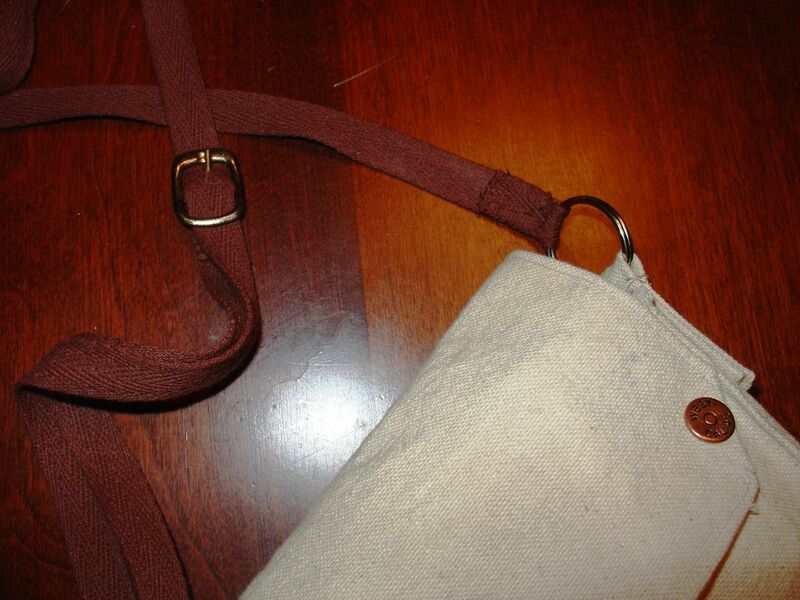 Put a gold snap in both corners of the flap, and put the backs on the corresponding spots on the front of the bag. Originally I thought about adding a zipper, which could be sewn in by hand, but in the end I didn't think I needed one. Finish, dye, and seal the leather strap if necessary. In the movies, the color ranges from dark brown to almost black. Rivet one end to the center bar of the buckle. Thread the strap through one of the rings and back up through the buckle. Check the length and trim the strap if necessary. Rivet the other end to the other ring. I had a hard time finding a leather strap, and in the end I decided to go with a woven one. This actually made things a lot simpler. I also lost the buckle pictured in the materials photo by the time I figured this out, so I used an old watch band buckle. This had the advantage of having a tongue, so the buckle won't slip, and also is "pre-aged", for that well-worn look. :D The strap was found in the trim section of the fabric store, and has a loose chevron sort of weave. 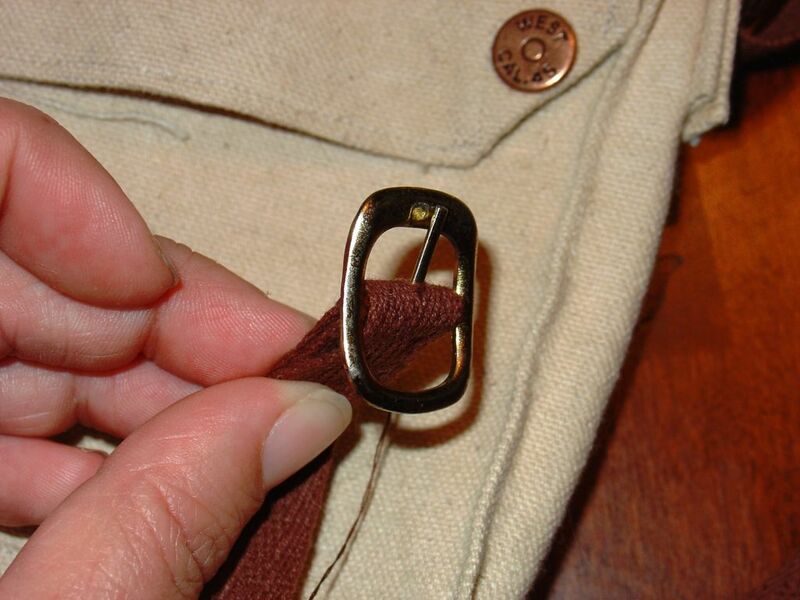 First, push the buckle tongue through the woven strap, leaving a few inches from the end. Fold this up so that the end of the strap will be hidden inside the fold. Sew this down so that the folded part lies on the same side as the buckle face. 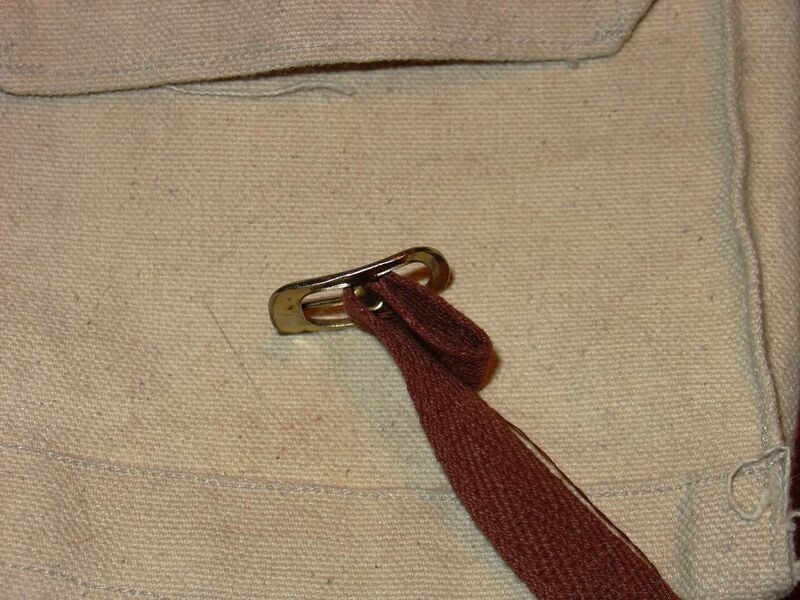 Then, draw the strap down through one of the rings on the bag and back up through the buckle. Then, loop the loose end through the other side temporarily. Adjust the strap so that the buckle sits about in the center of your chest at a comfortable length. Cut off the excess at the other end, fold the end under, and sew it down so that the fold is to the underside. With a loosely woven strap like this one, you don't need to worry about making a hole for the buckle tongue because you can slip it between the threads. made a sightly modified one for my son out of old jeans worked pretty well.. thanks for the idea! i'm currently in dying process with green wnd black tea. going to make a bigger one for my books. thanks for the nice idea, luv it!!!!!! how do you think it would work with nylon? Would I need to add an interior lining for sturdiness? Unless it's very thick nylon, I probably would line it. This is so cool :), loved it. I dyed my canvas haversack by soaking it in black walnut "seeds" that had been in the bucket for a few months. A nice tan that slowly reverts back to "dirty" canvas color. I also used bee's wax too. Keep by a fire (safely) and it melts in all nice and cozy. That haversack has saved me many times. So versatile. I like your work. Using oil based paint will give you a weather resistant pouch for outdoor use. You could also wax the canvas. I believe that the orginal bag was a WW2 gasmask bag issue to some troops but it had D rings for the strap which was canvas and brass press fasteners to secure it. You have made an excellent job of this one! That's a great looking bag!